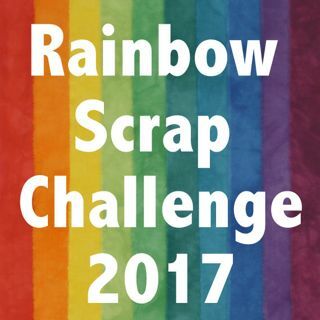 It is another Happy Scrappy Saturday over at Soscrappy Here is the linky page. I got more done on my four patch hearts. I had over thirty done when I started to put them on the wall. I quickly realized I did not have enough. I did not have much red left in my box but I dug around for more scraps and found more Reds. I also had so much pink I thought I should add Pink. My hearts are now pink and red. In digging for more scrap, guess what I found? more green. It is like it multiplies like bunnies. I have found another site to add new or finished sew projects to. Here is a linky to Sew Darn Ways. 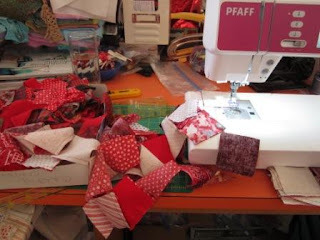 Check out the site many sewing projects not just quilting. Chain piecing more Red hearts. I did not tell you but my Pfaff was dieing before Christmas. So I asked for a new sewing machine. This is it. My sweet dear husband spoiled me and got me the new machine to replace my old Pfaff. I am really enjoying it. It has more options and more light then the old one. The old machine was 15 years old and had done a tonne or two of quilts. More piles made but not up on the wall yet. Maybe by next weekend. I am posting late on Saturday because Lex and I were at an aglilty dog trial today. We had one very good round with a pass and a first place in Snooker. The other two rounds were not to bad but not a pass. Each run today had some very good parts or improvements. It was a very good doggy day and lots of fun. these are looking great Cathy. And high five to you and Lex too. Love those hearts - they look fabulous! Oh, I love those little hearts! Thanks for leaving a nice comment on my blog. 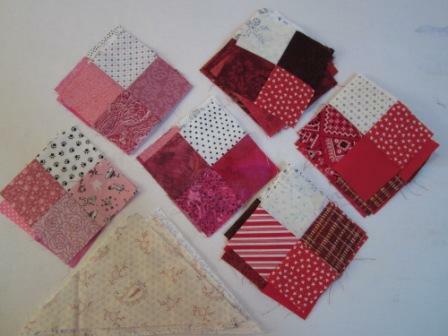 I'm looking forward to seeing how this little heart quilt evolves! Lovely red hearts! The pink added in will add some nice variety too. Hope you have a great heart quilt done in time for Valentines day! 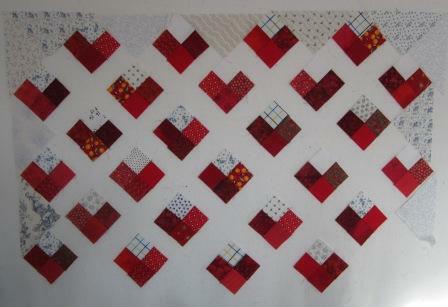 Love your hearts, this will be a great quilt! Cute blocks! I love the idea of a heart quilt.